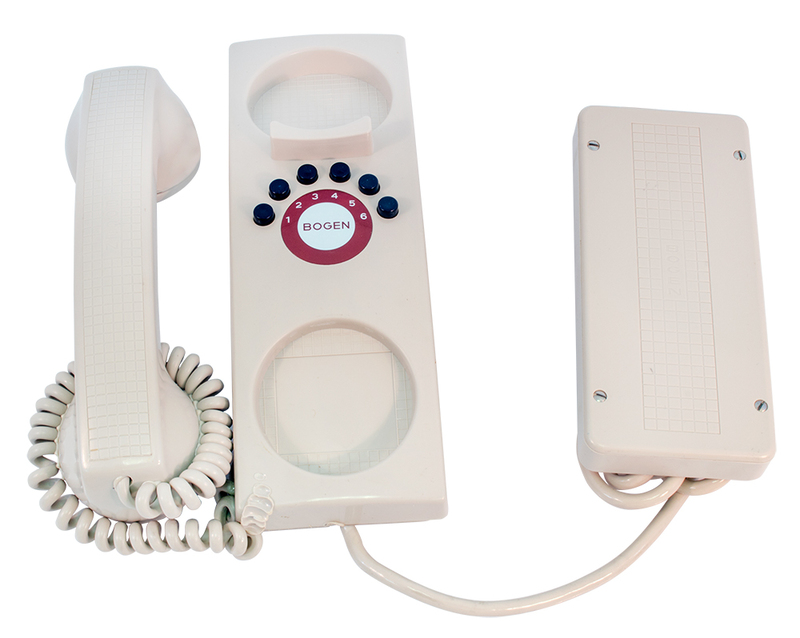 Bogen / Lear Siegler internal telephone intercom handset. Model #TQ6-A. Vintage surplus. 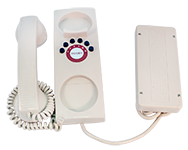 Used with Bogen paging / intercom / public address system. Includes mounting panel. Bogen P/N: 94-1171-41. Beige. 9-1/2"L x 3-1/4" x 1-1/4"H base. Perma-Power S100 Roving Rostrum. The original portable PA system. Battery operated PA amplifier and speakers. The cover removes to reveal an angled rostrum for notes, etc. The amplifier, speaker and partial mic stand are built into base. The cover has provisions for accessories, a 40 foot speaker cable and the auxilary speaker. Access to the amplifier and batteries is made by depressing a spring loaded pin and lifting off the silver rostrum cover. The solid state amplifier uses 2 Everready 731, 6 volt lantern batteries that mount in the base. The amplifier accepts a 1/4" phone plug for the microphone and an RCA jack for the phono input. The speaker jacks are 1/4" phone jacks that allow just the base speaker, both speakers or just the remote speaker to be active. Batteries shown are for illustration purposes only. They are dead and not included when shipped. Cabinet is 3/8" plywood with plastic covering that shows some wear. Unit works fine. J.W. Davis portable mic mixer. Model MIX-818 battery operated mic mixer. Probably one of the first products they produced. 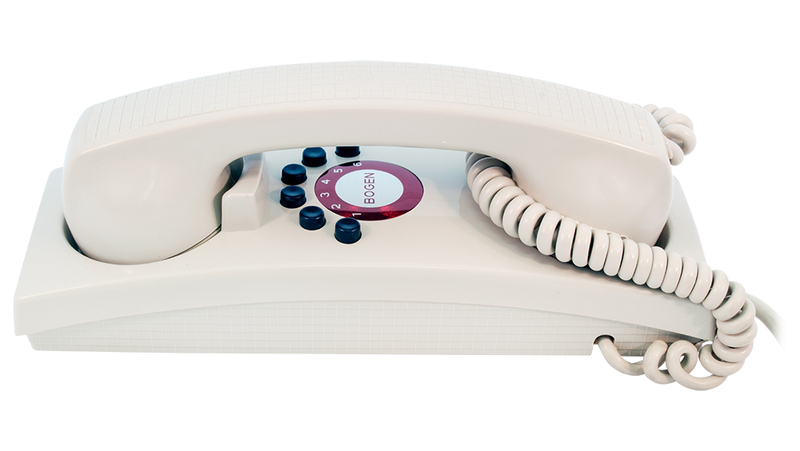 This unit accepts up to 8 high or low impedance (switch selectable) microphones. Each has its own one transistor amplifier and gain control. On the output, there is another single transistor amplifier and master gain control with both low and high impedance outputs. 'Music In' via an RCA jack on the back panel, with its own level control, is shared with microphone 1. Rear panel microphone inputs are Amphenol MC801M or RCA female. The unit is powered by 4 internal D-cell batteries. There is a 1/8" mono jack on the back panel for 6 vdc in from an external power source. Housed in a well made steel case, this unit appears almost new. Schematic diagram for this unit and operating instructions for 5 channel MIX-554 included.